Bayern went into this one with two wins – in Athens and Wolfsburg – and wanted to build on their recent run. Mainz, in the meantime, have not scored in five Bundesliga games. Mainz v Bayern saw der Karnevalsverein score their first goal in five matches but it was not enough to beat Bayern. It was not easy for Bayern to find space to dissect Bayern at the opening stage. Mainz, in turn, tried to break quickly forward whenever they won the ball in their end. But both sides lacked precision during the opening stage and, as a result, it took until the 20′ minute for Bayern to finally produce something tangible. David Alaba whipped in a cross from the left and Mainz keeper Florian Müller had to risk his neck to reach the ball ahead of his namesake Thomas Müller. 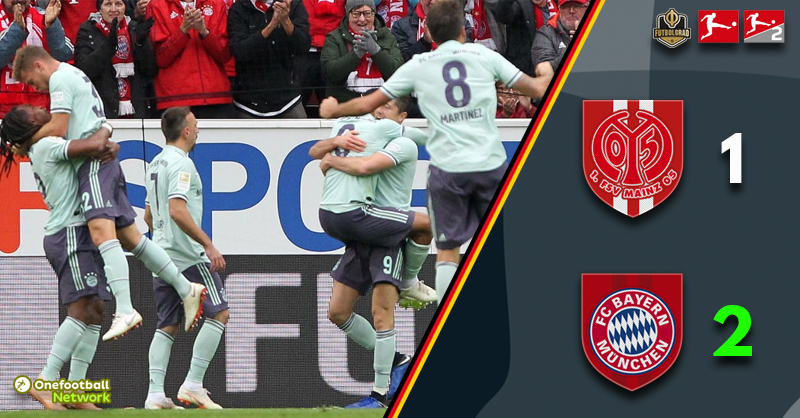 The half-chance underlined how difficult it was for Bayern at the opening stage to produce anything dangerous against a hard working Mainz side. Check out the Karneval in Mainz! Book your European football travel now by visiting Nickes.com! In the 26′ minute, Bayern finally had their first shot on goal. Joshua Kimmich found himself with plenty of space in the box and unleashed a hammer of a shot that hit the underside of the bar and then bounced on the line to stay out. In the 30′ minute, Bayern had their goal. 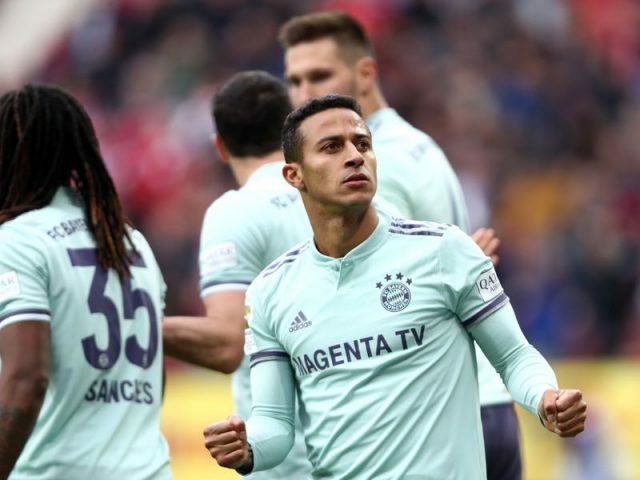 Thiago scored from close-range but the goal was disallowed after referee Harm Osmers consulted VAR, which showed two fouls committed by Bayern in the box ahead of Thiago’s goal. Bayern would, however, get their goal in the 38′ minute. A long ball from Alaba found Kimmich on the right, the right-back crossed the ball to the centre and Leon Goretzka scored his first for Bayern with a wonderful volley. Within two minutes of the second half, Mainz were level. In the 48′ minute, Daniel Brosinski crossed the ball from the left and found Jean-Paul Boetius unmarked in the box and the Mainz forward tapped the ball across the line. Shortly after Bayern lost Goretzka to an injury and Renato Sanches was brought on to replace him. Bayern were only vulnerable for a moment, however, and retook the lead in the 63′ minute. Renato Sanches won the ball in his own half spotted Robert Lewandowski on the right, the striker played a hard ball in the box, where Thiago hammered the ball across the line from a close distance. Javi Martinez then almost wrapped it up in the 78′ minute. The defensive midfielder was given to much room in midfield and unleashed a shot from 30-yards out that hit the post of Florian Müller’s goal. Just one minute later Bayern fans were rewarded with a rare sight. Defender Niklas Süle was sprung loose on a counter-attack in the 79′ minute and went one-v-one with keeper Müller, who had to do well to keep the defender from scoring. Mainz, however, staid in the fight and in the last ten minutes pressed for the equaliser. But Bayern remained in control and saw the game out for three deserved points. Thiago was the man of the match. The Spaniard scored a goal and completed 91% of his passes. The midfield maestro acted like a metronome in the midfield of the Bavarians ensuring stability against a Mainz side that was surprisingly aggressive against der Rekordmeister. Bayern are back within two points of Borussia Dortmund after the Yellow and Blacks dropped two points against Hertha at the last minute. At the same time, Bayern’s performance against Mainz still lacked the spark that we often saw from the Bavarians in the last few years. If anything the game highlighted that Bayern remain vulnerable. After failing to score for 497 minutes and 5 consecutive games, Mainz finally scored a goal. Bayern have won the last six games in Mainz and the Bavarians added another win to that record this afternoon. Mainz’s record at home against Bayern is now a shocking W2 D1 L10.